March 18, 2015 By Tina M Leave a Comment This post may contain affiliate links. Read my disclosure policy here. I saw that Horizon has come out with some new kids snack products and I thought it would be fun to implement them into a snack mix for the kids. I love that horizon products have simple organic ingredients that you can recognize. 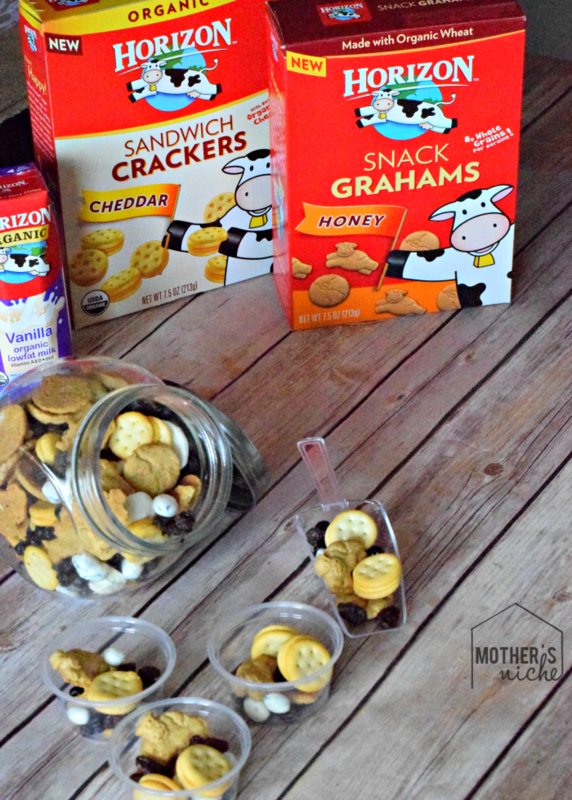 If you are keeping this snack mix at your house you can put it in a large cookie/snack jar with a scoop, or if you are using the snack mix for travel you can use a large Ziploc bag or individual snack cups. We actually use both when we are traveling. I put all the contents into a large ziploc bag and then scoop the snack mix into individual snack cups and give them refills at certain points in our trip (rest stops, after an activity, etc.). Horizon Apple Clusters (I REALLY wanted these in my snack mix but I couldn’t find them at my local store. I assume we will get them soon though). What’s YOUR Favorite Road Trip Snack? ?